This is a desk name plate made predominantly for 1st grade. On the desk plate there is a 120's chart with 5's & 10's highlighted in different colors. 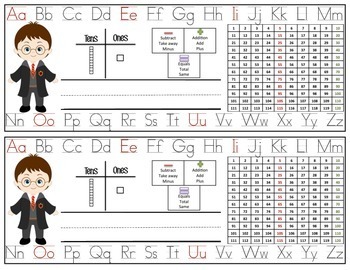 There is also a visual representation for tens & ones along with +, -, = and math words to assist in the learning process. The alphabet is written along the top and bottom with vowels in a different color. 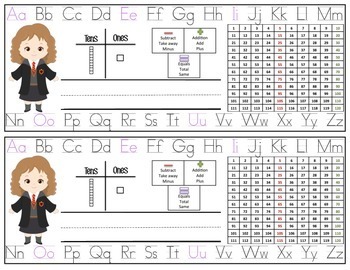 There is a page of boy's desk tags with Harry and a page of girl's tags with Hermione.